If you like your fish, you can keep it. If you like your charter service you can keep that, too. After many, many, many years chasing fishes on Lake Ontario our angling service is poised to enter a new method of operation that will positively enhance your charter experience. How's that you ask, well let me explain? The Dixie Dandy is now a part of the Cold Steel Fishing Fleet. Owned by legendary Charter Captain Tom Burke. The team now consists of the 33' Egg Harbor "Cold Steel" with Capt. Tom and Capt. Andy Bliss comprising a seasoned crew with several Salmon Tourney wins to their credit. 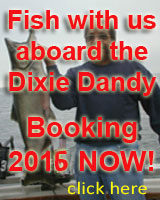 Tom's second boat is the highly regarded 31' "Dixie Dandy" manned by me and my 1st mate Licensed NYS Guide Zack Rayno. Believe me when I say that the combined on water experience of the 2 crews is second to none. The Dixie Dandy guided angler Tony Brown to the current NYS Record Brown trout, a 33lb 2-oz monster in June 1997 and won the Oswego County Pro Am that same year. Both vessels have earned solid reputations for providing quality, productive and enjoyable charters. The two charter services spent the 2013 season working together to form a smooth running, team approach to Lake Ontario trolling efforts. When you fish with the "fleet" you get to take part in a multi boat charter effort that provides double access to the daily fishing puzzle that must be solved to produce quality fishing action. Each vessel knows exactly what the other is doing. 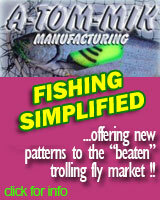 From lure selection, trolling speed, presentation depth and patterns, locating active fish and getting them to hook up is made simpler as you get two for the price of one. Pieces of the fishing puzzle are shared between the two vessels to maximize catches and provide a top-flight charter experience. This system has clearly proven that "working together" methods generate quality results. 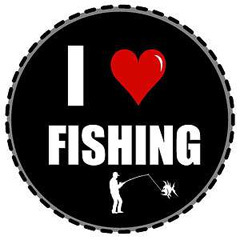 That is why we can say with certainty that in 2014 the Cold Steel Charter Fleet will provide another season of exciting and productive angling adventure. 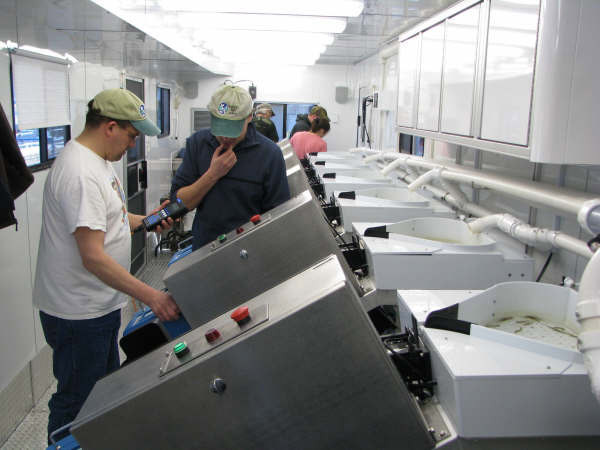 Tom, Andy, and Zack are all involved in the fishery on a yearly basis. In addition to their April through September lake trolling efforts, they each fish the fall and winter months guiding on Lake Ontario tributary streams for trout and salmon. 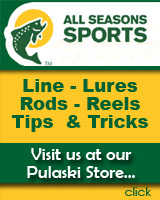 Be it on the lake or tribs, they are proven, time tested pros totally committed to their charter and guiding professions. I myself would like to fish the tribs, however the warm breezes emanating from Georgia and Florida lure me to the south where stripers, sailfish, pompano and the Daytona 500 await. My motto is, "let the younger guys do it", because in the winter, the southern climate beckons. Once April returns, so do I, and the Dixie Dandy returns to action. Damn I'm a lucky guy. While many historic battles have taken place along the shores of Lake Ontario, the beat goes on as the latest environmental turmoil arises over the latest lake water level proposal. While still in the study phase, environmentalists and the outdoor community favor a more natural approach to control by allowing the lake to rise and fall according to the whims of nature. I have seen high water one year and low water the next and while I prefer the high water it may not be the best solution with regard to proper lake management according to an International Joint Commission. On the other side of the equation are property owners and businesses that could face financial disaster depending on too high or too low water levels. For example a marina might have plenty of water for a time but when nature causes low water conditions, the marina could actually be out of business during the low water cycle. As these people say, muskrats and cattails would be placed ahead of property values. The solution is most likely somewhere in the middle, which is usually the case. We shall see what transpires and what elected officials move from the sidelines into the fray. This one should be good as it affects so many Lake Ontario stakeholders.